In September of last year, we released the results of seven years of polling up-and-coming Ghanaian poets on the question "Which poets have most influenced and informed your work?" The answer, loud and clear: Kofi Awoonor and Maya Angelou. What a shock it has been to lose them both in the months that followed. And what a challenge to the next generation, required now to do their best to fill this gaping hole. But we have their poems still, thank goodness. While not born in Ghana, in the early 1960s Angelou lived in Accra, where she was an employee of the University of Ghana's School of Music and Drama, the features editor for The African Review, and wrote for The Ghanaian Times. It was in Accra that she met Malcolm X, with whom she returned to the United States in 1964, her life and writing forever shaped by her time in Ghana. And, as it turns out, Ghanaian writing forever shaped by her. In our poll, Angelou's name came up more often as a poetic influence than any other North American artist, and (by a wide margin) more than any other female artist. Angelou's was one of few modern, outside voices to penetrate Ghanaian poets' consciousnesses, and virtually the only female voice. Let this reality be a challenge to North American writers and female writers alike, of course, but more essentially, let it be a challenge to all of us as readers and champions of new writing: to make space for outside voices, still often drowned out. To allow the new, strong female voices of the following generations to rise. 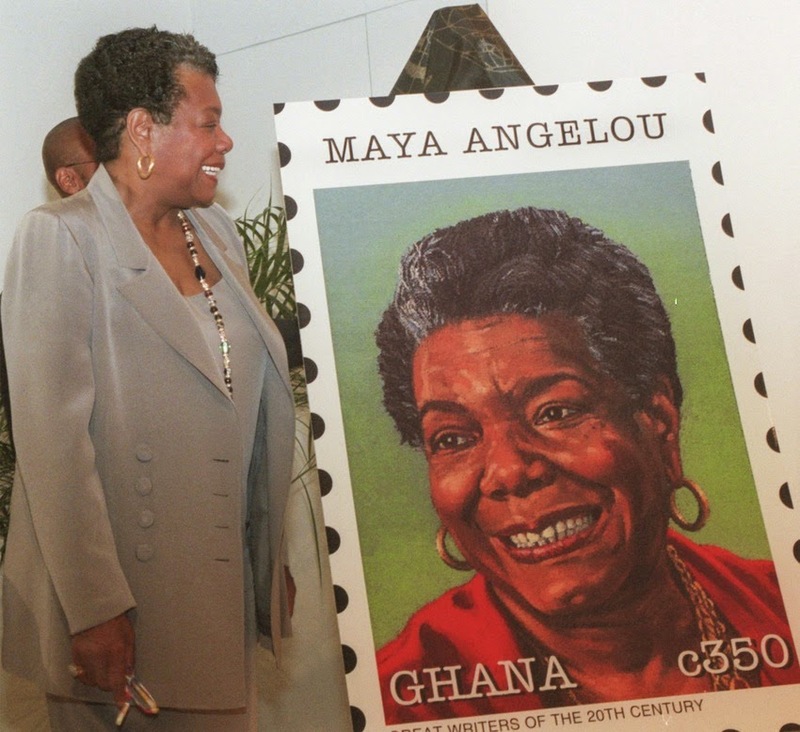 When you think of Maya Angelou in the coming days, think too of female Ghanaian poets writing now. Think of Edith Faalong. Think of Vida Ayitah. Think of LS Mensah. Aisha Nelson. Emma Akuffo. Juanita Tsikata. Mariska Taylor-Darko. Nana Yeboaa. And on. And on. Think of them and celebrate. This, more than anything, seems like a great way to honour Maya Angelou's legacy today.